Warm, garlicky breadsticks fresh from the oven make a satisfying side for pizzas, pastas, soups and salads, but taking the time to make and knead the dough may put your dinner plans on hold. Fortunately, breadsticks freeze well so you can prepare the dough ahead of time and freeze them individually wrapped before the final rise. Thawing and heating the frozen breadsticks properly ensures they have the best texture and don't dry out during cooking. Unwrap the breadsticks and place them in a greased microwave-safe dish. Heat for one minute or until completely thawed but not warmed. Transfer the breadsticks to a greased baking pan. Cover with a towel and set the pan in a warm area. Allow the sticks to rise for two hours, or until doubled in size. Bake the breadsticks for 10 to 20 minutes, or until they are develop a golden brown color. Brushing the breadsticks with butter before baking helps them brown more evenly. Thaw and heat precooked breadsticks in a 450 F oven for 10 to 15 minutes, or until they are completely thawed and warmed throughout. Unbaked breadstick dough retains its quality in the freezer for up to one month, while prebaked breadsticks store well for two to four months. 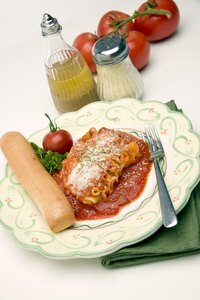 Utah State University Extension: Why Freezer Meals? Can You Freeze Bacon-Wrapped Dates?